Iyengar Yoga (IY) is classical yoga made current. It rests on satya (truth saying), asteya (non-stealing), bramacharya (moderation), aparigraha (non-attachment) and ahimsa (nonviolence) universal truths. Ancient yogins demarcated the means to avoid troubles in life - estimable thought, speech and conduct. This effort is called Karma yoga. Humility is a whetting stone to correct character flaws, mental perturbations and physical limitations. Yoga medicine is systematic, noninvasive, safe and effective and steeped in lovingkindness. Benefits compound with efficacy. B.K.S. 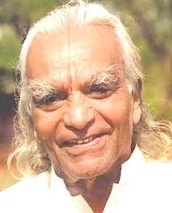 Iyengar, one of a 100 most influential heroes of the 20th C (Time Mag, 2003) made yoga accessible worldwide via literary works, well-trained teachers and props-inventions. Love by a Sadhaka (Seeker) of a teacher who has attained enlightenment is Bhakti Yoga. In Light on Yoga (LOY): Guruji elucidated the 8-facets of yoga practice: 1. yamas/conduct; 2. niyamas/self-care; 3. asana/mobilizations; 4. pranayama/breath regulation; 5. pratyahara, withdrawal of senses; 6. dharyana, selective attention; 7. dhyana, transcendence; and 8. samadhi, oneness. Jnana Yoga is devoted study of Yoga. Appendix I of LOY, gives sequences, timings and instructions for standing, inverted and floor asanas, backbends and forward bends that dynamically transform the body, its energy and the sense of well being. Karma Yoga is living by discriminatory conduct - the middle path. His experimental proofs, his body the lab, elaborated therapeutic methods that rehabilitate chronic ailments. Hundreds of thousands worldwide have benefitted. Iyengar was a living example of what anyone can do in a lifetime by devotion to right path that leads to peace, harmony and happiness. Raja Yoga is the full-fold path. This is Iyengar Yoga.